Navy veteran Jeff Heiser has always loved snapping pictures. This spring he'll graduate with an Associate of Applied Arts with a Specialization in Photographic Media Arts. Jeff Heiser owns his own business, Epic Beard Photography. After 12 years in the Navy, Jeff Heiser tried his hand at “a real person’s job” working as a field service engineer. He hated it, realizing he wanted his future to be about what he so enjoyed in his past – snapping pictures. Now he runs his own business and has the education to go with it. Heiser will graduate this spring from Tidewater Community College with an Associate of Applied Arts with a Specialization in Photographic Media Arts. Heiser is grateful to be studying under Professor Tom Siegmund, who provides, he said, an academic foundation for many of the technical skills he’s already mastered. Heiser has also improved his Photoshop skills and with the help of Siegmund, gained an internship this spring with the automaker Valeo, where he focuses on product photography. Heiser’s business, named Epic Beard Photography in deference to his chin of fuzz that a random teenager called “an epic beard,” shows off his versatility. One of his specialties, theme photography, allows him to explore clients’ offbeat interests; a recent shoot explored a King Arthur theme. 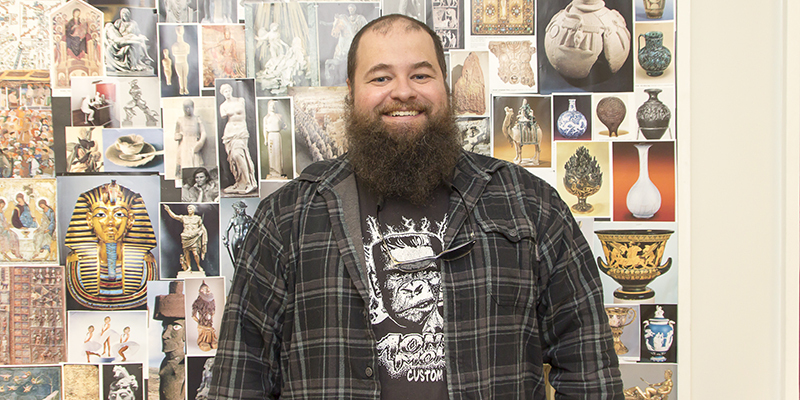 His pinup, “I can do this too,” is part of TCC’s student and faculty arts exhibition that opens at the VAC on March 24. He’s a regular photographer for the Virginia Beach Horse Show Association and recently bought his own Saddlebred, Grace, for shoots. “Who wouldn’t want an engagement shoot with a horse?” he asked. Someday, Heiser would like to try his hand at aerial photography from a helicopter and hopes to travel to the deserts in Africa to photograph the animals there. He also plans to work toward his master’s in fine arts and later teach young, creative minds in search of the foundation he discovered at TCC. He recommends plowing forward for anyone remotely considering a photography career.